Bangkok is a city of contrast that celebrates both its forward thinking and historical atmosphere. Temples tower over cobblestone streets and tree-clad lanes. The Chao Phraya River continues to act as a historical highway, traversed by ferries, fishing boats, and travelers making their way to distant towns outside of the city. The locals believe in the spirit of sà-nùk, which means fun. That ideal permeates the city, emanating from the vibrant smiles of Bangkok residents when relaxing in a riverside café or strolling through a luxurious fashion mall in the Chidlom district. Your private transfer meets you at the airport upon your arrival and escorts you to your lavish accommodation situated alongside the banks of the Chao Phraya River. In the evening, the city continues its energetic and jovial atmosphere. The aromas of ginger and lime intermix in the Bohemian atmosphere surrounding the JJ Green Night Market. The cultural wonders of the city are endless, and the friendly attitudes of the locals are always prevalent, welcoming you to Bangkok and making you feel at home. The sun rises, accompanied by the revitalizing aromas of cilantro and chives. At breakfast, you sip a tea that has been slowly steeped with loose leaves, bringing an indulgently floral scent to your meal. 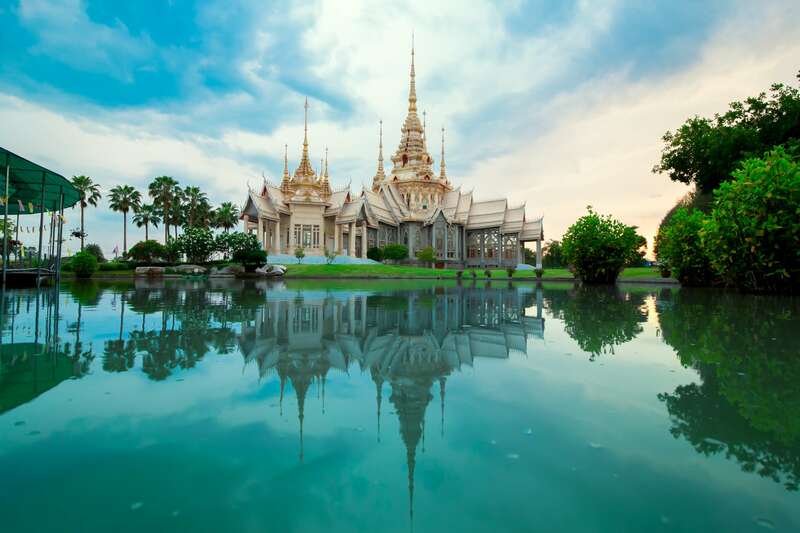 Your guide meets you at the hotel, eager to take you into the city and show you the historical treasures brimming in Bangkok: from the Grand Palace to the maze of canals and waterways connected to the Chao Phraya River. Consider reading some of our travelers' Thailand tour reviews to learn more about the sights and destinations you may be interested in exploring. You first stop at Wat Pho, one of the largest and oldest temples in the city, which sets a marvelous sentiment for the remainder of your tour. King Rama I established Wat Pho, also known as the Temple of the Reclining Buddha, in the 16th century. The complex contains four great gilded stupas (Buddhist religious monument) that shimmer in the drifting sunlight, interspersed with 91 miniature stupas. Inside the temple, you are immediately drawn to the magnificent Reclining Buddha, a gold-leaf statue that measures nearly 50 feet tall and more than 147 feet long. The Buddha’s feet are 16 feet long; they are also decorated with mother-of-pearl lakshanas, special bodily features of Buddha. The temple paints an inspiring picture of the city and its cultural history that the remainder of your exploration will follow. What’s Included: breakfast, lunch, guided tour, accommodation. In the morning, the Chao Phraya River erupts with life at the Damnoen Saduak floating market. Locals fill their boats with radiant and fresh produce, from pineapples to chili peppers, and sell their wares on the water and the riverbanks. At breakfast, you find the aroma of fresh pineapple alluring. The chilled yellow fruit brings a sweet juicy flavor to the morning. Your guide meets you in the lobby after your meal, ready for you to discover the hidden sights of the city, from historical wooden homes to ethnic flavors of centuries-old Chinatown. Chinese merchants settled in the neighborhood in the 18th century. Your guide points out Hua Lamphong Railway Station, which was erected in 1916. The neo-renaissance style creates a similar façade to the city’s government buildings. Vibrant and enticing aromas drift from food vendors across the neighborhood, bringing an extra layer of luster to the character of Chinatown. Your guide explains the importance of various dishes connecting Chinese and Thai culture over the years. Yaowarat is the Chinatown’s main street. Restaurants and food stalls line the walkways. Your guide leads you to one of the finest seafood establishments for you to taste the succulent barbecued prawns. After breakfast, your private transfer escorts you to the airport for your flight north to Chiang Rai. You quickly venture out of the delightful city and into the remote corners of the mountainous jungle to your stunning accommodation located near the Golden Triangle. After you settle into your regal-style accommodations, you board a comfortable custom-designed riverboat to explore the Mekong River. The Golden Triangle is a beautiful rural area where the countries of Thailand, Burma, and Laos meet. You can dip your fingers into the rushing river and feel the cold water of the Mekong, which begins at the Tibetan Plateau and travels to the South China Sea. The grass grows tall and lush along the riverbanks. In the town of Chiang Saen, you can find elements of a former empire dating back to the 7th century. You can see the Laotian village of Ton Pheung across the water. The ruins of Wat Pa Sak stand near the main historic gateway of town. The 14th-century stupa (Buddhist religious monument) contains various architectural styles and artistic elements. The quiet nature of the park carries an ethereal quality. Stucco relief works display Sukhothai influence decorating the higher tiers. The fast pace of Bangkok has faded away, and the serene elements of the north brought the unique elements of ancient culture to light. In the morning, you can hear black-throated sunbirds twittering in the canopy. They tend to prefer the evergreen forests and upper slopes. In the distance, the Mekong River rushes against the dangling grass of the riverbanks. After breakfast, the day is yours to delight in the exceptional splendor of your jungle seclusion in the lavishness of your luxurious accommodation. You could spend time in the spa letting the natural minerals of the Thai countryside rejuvenate your body and spirit. Or consider partaking in a yoga class while listening to the natural sounds of the forest. Asian elephants roam through the wild brush of the landscape and maintain a high status in the cultures connected to the jungle. You accompany some of the staff to a local pond to help lead and bathe the elephants. The Asian elephant can grow to a shoulder height of nine feet and prefer grasslands and tropical evergreen forests. They sway with each measured step they take. The elephants don’t hesitate to submerge themselves under the water. They bend their knees and attempt to cover themselves with a refreshing soak. You can help the staff scrub behind the elephants’ ears. The elephants become playful and spray water at one another, getting you in and the staff in the crossfire. You are thrilled you could experience an up close and personal encounter with the graceful creature. What’s Included: breakfast, lunch, dinner, guided tour, accommodation. After breakfast, you fly from Chiang Rai to the island of Phuket, located in the Andaman Sea. You board a high-speed ferry and arrive on the extraordinary island of Ko Yao. Lush mountains create the backbone of the landscape. The shorelines consisting of pure golden sand and glowing turquoise water emanate purity. The island is situated inside the Ao Phang-Nga National Park, encompassing 153 square miles of preserved land and sea. Mangrove forests provide unique canals on the west coast. Your private transfer meets you at the dock and escorts you to your lavish accommodation known for its private pools and eco-friendly nature. You can relax by the pool with a view overlooking the verdant trees, turquoise water, and nearby karsts decorating the sea. The locals preserve their traditions and enjoy the tranquility of the island’s seclusion. You can see various longtail boats dotting the horizon, with fishermen casting their nets in search of a daily catch. With the serene panorama and quiet ambiance of the island, you have found a utopia. In the morning, you can hear the quiet sweeping of the Andaman Sea against the golden shores of the island. The scent of fresh coconut and banana accompany the assortment of goods at breakfast. The day is yours to revel in the tranquil paradisiacal lifestyle of Koh Yao as you desire. You could stretch your body and spirit with a yoga session on the beach or indulge in a famous Thai massage with a view of the water. For a more adventurous day, you decide to venture into the Ao Phang-Nga National Park on a guided tour. You board a luxury cruise and set out on the water. The Andaman Sea has a refreshingly warm temperature. You pass by steep vertical cliffs that frame the 42 islands of the protected marine park. You can see large monitor lizards basking on the rocks, lazily absorbing the sun. When they enter the water, their snouts protrude over the surface, as they use their tails to propel themselves forward. The monitor lizards can grow to more than three feet long and can stay submerged in water for up to 17 minutes. Mangrove trees create natural tributaries that local fishermen utilize as water highways to connect the islands to the sea. The breeze carries a sweet and fresh aroma. The tremendous limestone karsts rise out of the water, setting a powerful ambiance across the seascape. Some of the islands have hidden caves that are reachable during low tide, embodying the beauty that is both seen and hidden. In the morning, the sunlight stretches across the Andaman Sea, adding an intoxicating shimmer to the water. At breakfast, you can sip on a cup for fresh coffee in the gentle ocean breeze. The day is once more at your leisure to delight in the quiet splendors of the island. You could kayak along the shoreline or lounge on the beach. For a relaxing experience, you could visit your resort’s spa for a stunning and indulgent ambiance situated in the tropical hillside. You find a floral fragrance emanating from the lily pond. The thatched roofing recalls elements of the traditional architecture seen around the island. You find a lingering hint of coconut in the air. You can relax in the tranquil surroundings with the subtle sound of the sea wading along the island’s shores. The tropical afternoon feels cooler in the spa. You settle into the comfort and can feel the tension gradually releasing from your body. Your masseuse invokes a light pressure massage, combining techniques ranging from head massage to foot acupressure to help evoke a deep sense of relaxation. When your treatment ends, you take a look once more at the turquoise water and find the view even more radiant. In the morning, the sunlight casts over the gold sands of the beaches. The mangrove shores create lush walls beneath the towering limestone cliffs. At breakfast, you take in the panorama of the island and nearby karsts. You can see a small group of people paddling out on the water with kayaks. Locals in longtail boats set out to sea in search of the perfect location to cast their nets. After breakfast, your private transfer escorts you to the dock where you catch the ferry to Phuket. Your connecting transfer escorts you the remainder of the way to Phuket International Airport for your flight home. Embark on an extravagant privately guided foodie tour of Bangkok for an in-depth view of how the cuisine has guided its cultural identity. Enjoy lavish accommodation in Thailand’s secluded areas, providing comfort, luxury, and privacy. Cruise down the splendid Mekong River on a custom tailored longboat to view the treasures of the Golden Triangle. Indulge in the paradisiacal ambiance of Koh Yao Noi, home to pristine beaches and breathtaking scenery. Delight in the unique experience of helping bathe Asian elephants in the jungle of northern Thailand.